Mother Mary is the archeia of the fifth ray and twin flame of Archangel Raphael. Although an archangel, Mary has also taken physical embodiment. In the early days of Atlantis, she served in the Healing Temple, tended the flame and studied the healing arts and the disciplines necessary for precipitation. At that time, she developed great concentration and consecration to the immaculate concept. It was her consciousness and momentum more than any others that sustained the flame in the temple and expanded its influence throughout Atlantis. The purity of her heart flame and her devotion shone upon her face and was evident to all who frequented that Temple. She remained a temple virgin during that entire embodiment. In the days of the prophet Samuel, Mary was called to be the wife of Jesse and the mother of his eight sons. Ever fulfilling her role as the Mother ray, Mary, in this incarnation of her soul on earth, magnified the light of the seven rays of the Christ in the first seven sons of Jesse. But in the youngest, David, she glorified not only the full complement of virtues from the prism of the Lord, but also the majesty and mastery of the eighth ray, which David exemplified in his reign and extolled in his psalms. David himself was reembodied as Jesus, and thus in the Psalms, the Israelites have recourse to the teachings of one who has attained Christ-mastery while Gentiles also reflect upon the meditations of the Saviour, all striving for the same goal set forth by him who is known as both the king of Israel and of the New Jerusalem. And so it is not surprising that today in the Cenacle overlooking the city of Jerusalem, Christians pray in the Upper Room on the site where Jesus and the disciples celebrated the Last Supper, where Christ appeared after his resurrection, and where the descent of the Holy Spirit took place. And in the lower level of the same house, there is a temple where Jews worship at the Tomb of David. Nor is it surprising to those who offer praise to her name that Mary is the Mother of both the Judaic and the Christian dispensations. In her final embodiment, Mary came forth under the direction of hierarchy, chosen of God to bear Jesus the Christ, who would demonstrate the laws of alchemy and the victory that every man must attain over sin, sickness and death. In early childhood she was placed in a temple for training in the science of the immaculate concept. Her twin flame, Archangel Raphael, together with members of the angelic host and the God and Goddess Meru, assisted her in the development of the Mother principle in order that her consciousness might become a womb for the seed of the Christ. During childhood she focused in her outer consciousness those momentums she had developed long ago on Atlantis and at inner levels before taking embodiment. When Mary was still a young girl, Joseph (an embodiment of Saint Germain) was sent to be the guardian and protector of Mary and Jesus. Together, the three members of the Holy Family composed the threefold flame that was not only the basis for family unity but also for the entire Christian dispensation. 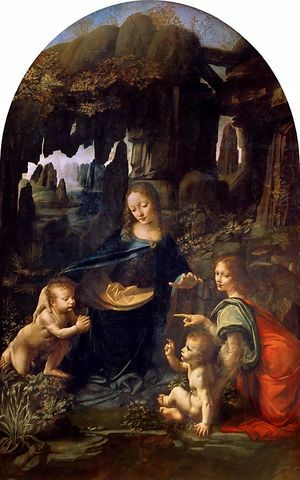 For thousands of years prior to taking embodiment, Mary had invoked the momentum of the fifth ray and studied how to hold the perfect image or blueprint of the Christ and of the specific precipitation that was the requirement of the hour—a flower, a temple, a flame, a work of art or an entire civilization. Whatever the precipitation, there must be one lifestream who is dedicated to its manifestation, who visualizes its components and through whose consciousness the energizing power of the Holy Spirit flows in order it give it form and life. This is the activity of the representative of the feminine ray of the Motherhood of the Godhead. Mary fulfilled that role for Jesus, and therefore, through her consciousness came the purity and the power and the love that enabled him to fulfill his mission. During the final three years of his ministry, after his return from the Far East, where he studied in the Himalayas under Lord Maitreya, his guru, Jesus entered public life. This period was a great test for Mary, and only her momentum on the fifth ray enabled her to sustain the matrix of victory unto the very end. After Jesus’ ascension, she gathered the disciples and friends and formed a colony at Bethany, where they met to receive instruction from their Lord. Saint John of Damascus describes how at the close of this magnificent embodiment of service and initiation, Mary ascended from a tomb in which the apostles had placed her body after her passing. Upon opening the tomb three days later, they found only twelve white lilies. After her ascension, Mary was made representative of the World Mother with a title of Queen of Heaven for the Christian Dispensation. Although all ascended lady masters keep the flame for the World Mother as her representative, we think of Mary as the archetype of Motherhood, the Mother of mothers. Until 1954 Jesus and Mary held the focus of the masculine and feminine rays for the sixth dispensation. At that time, Saint Germain and Portia assumed the office of directors for the coming age on the seventh ray for the seventh dispensation. Mary’s ascension is celebrated on the 15th of August. Since her ascension, Mother Mary has appeared throughout the world, producing many miracles of healing. She set the stage for these appearances in the later years of her final embodiment, when she visited various areas of the world accompanied by John the Beloved and five others. They went first to the retreat at Luxor, Egypt, and then on a voyage by boat to the Island of Crete across the Mediterranean Sea, through the Straits of Gibraltar, stopping at Fátima in Portugal, Lourdes in Southern France, Glastonbury in the British Isles and Ireland. In all these places, Mary and those serving with her drew focuses of the fifth ray, establishing the flame of science, healing and precipitation, preparing the way for those who would come after her to amplify the Christ consciousness. These visits laid the foundation for the work of the apostle Paul in Greece and her own appearances at Fátima and Lourdes. The Holy Grail, the cup used by Jesus at the last supper, was buried in a well at Glastonbury. Here was planted the flame of the Christ, which later inspired King Arthur to form the Knights of the Round Table and to engage in the quest for the Holy Grail. Saint Patrick drew upon the focus of the threefold flame placed in Ireland and later taught the mystery of the Trinity, using the shamrock to illustrate the oneness of the Father, Son and Holy Spirit. The emerald-green healing flame remains the symbol of Ireland and the remembrance of that journey long ago by those seven representatives whose devotion to the seven rays enabled them to succeed in paving the way for the expansion of Christianity throughout Europe and ultimately the Western Hemisphere. The Aquarian age is the age of the Mother and the Holy Spirit. It is the age when we are meant to experience and express the Mother aspect of God. Coming to understand this feminine aspect of God can liberate the creative feminine energy within us, both man and woman—the energy of beauty and creativity, intuition and inspiration. The concept of God as Mother is not new to Eastern spirituality. The Hindus meditate upon Mother as the Goddess Kundalini, describing her as the white light, or the coiled serpent, that rises from the base of the spine to the crown, activating levels of spiritual consciousness in each of the chakras (spiritual centers) through which that light passes along the way. Whether we are male or female, we are intended to raise this sacred light of our innermost being that lies dormant within us. The key to unlocking this energy, the Kundalini, is adoration of the Mother principle. The raising of the Mother light is a part of Western tradition also. It is for this purpose that Mother Mary appeared to several of the saints with the safe and sound method of raising the Mother light through the Hail Mary and the rosary. The saints have been portrayed with a white light, or halo, around their heads because they have raised the Kundalini and opened their crown chakras. They have entered into the bliss of God. The great Christian mystics such as Saint John of the Cross, Saint Thérèse of Lisieux and Padre Pio have all had this inner experience—so filled with the divine passion, the bliss of the Beloved, as to defy comprehension. As we enter this new era, Mother Mary has released a New Age Hail Mary and a New Age rosary. In giving the Hail Mary, Mary has asked us to affirm that we are sons and daughters of God rather than sinners. She also asks us to affirm our victory over sin, disease and death. Over sin, disease and death. I extend to you, then, access by the rosary—by the rosary—to my causal body, to the attainment on those fourteen stations that I have gained throughout my long spiritual history. I give you, therefore, the opportunity to receive that power and attainment that God has given me as my great Teacher. And as I am his servant, this I transmit to you that it might become close to the physical world and the physical problem through your own physical body and heart. Today she works with the master El Morya and the Darjeeling Council in their service to the will of God on behalf of all mankind. 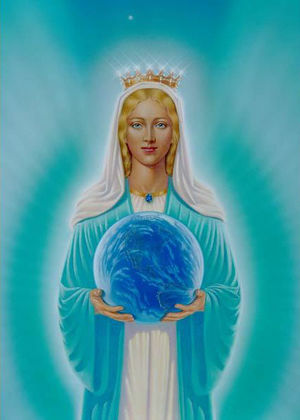 She has a blue cape focusing that will and its intense protection for the Christ consciousness emerging within every soul, and when called upon, she will place that cape around all who are in need of the protection of a mother’s love. She renders assistance with Archangel Gabriel in preparing the way for the incoming children, in teaching the parents and in guiding the body elementals in forming their physical bodies. Mary’s focus of the Sacred Heart in the Resurrection Temple is the focus of the threefold flame commemorating the mission of the Christ of the Holy Trinity. 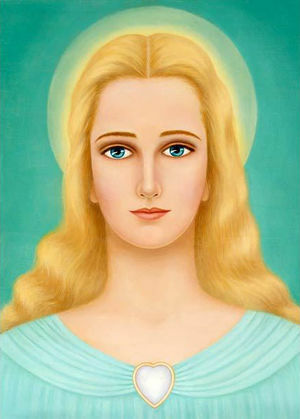 Her service with Saint Germain and Jesus laid the foundation for two thousand years of Christian belief and service and also for the coming age. Mary says, “My appearances through the centuries have centered on the request for prayer and for the giving of the rosary for the saving of souls. Millions have been saved because millions have responded to my call.” In her appearances at Fátima, Medjugorje and other places in the world, Mary has told of what may come upon the earth if we do not heed her warnings. I live with the Fátima prophecy. I live with its message. And I go from door to door and heart to heart knocking, asking for those who will come and pray with me—pray the violet flame or the rosary or the calls to Archangel Michael. But above all, pray. For by thy prayer is the open door extended, and the angels come stepping through the veil to prevent disaster and calamity. The land is plagued with darkness upon the screens of the invention of the motion picture. The land is plagued with darkness over the churches devoted to honor my Son’s name. The land is plagued with darkness as the political candidates struggle among themselves seeking a temporal crown.... The elementals have communicated recently with one another, and they are preparing to execute cataclysmic strands of destruction that have only begun in the world order. And this shall come to pass unless the teachings of God shall be fulfilled in the hearts of many men and women presently totally dedicated to their own selves without understanding the great needs of humanity. Until a correct understanding of the I AM THAT I AM be made known across the land, governments will fall, economies will crumble, churches will come to ruin, darkness will cover the land, famine will be present, and souls will be lost. Within my Sacred Heart is the acceleration of light this day ... unto the judgment of those who have persistently denied the miracles of the Virgin Mary.... Let there be the judgment of the false teachers who have stolen into the churches with their false theology.... Everyone who has interfered with the birth of these little ones—everyone who has advocated abortion from the pulpits of the churches, I tell you they will suffer exactly the karma that is written in sacred scripture spoken by my Son, and it will not be withheld this day! Mother Mary is one of the great teachers of mankind. She instructs us in the science of the immaculate concept, the pure concept or image of the soul held in the mind of God. The immaculate concept is any pure thought held by one part of life for and on behalf of another part of life, and it is the essential ingredient to every alchemical experiment without which it will not succeed. The ability to hold the image of the perfect pattern to be precipitated, to see the vision of a project complete, to draw a mental picture, to retain it and to fill it in with light and love and joy—these are keys to the science that Mother Mary and Saint Germain teach. God is the supreme practitioner of the science of the immaculate concept. No matter how far man might wander from his individuality, God ever beholds man in the image of Reality in which he created him. This science of the immaculate concept is practiced by every angel in heaven. It is that law that is written in the inward parts of man, known by his very heart of hearts, yet dim in the memory of his outer mind. It is based on the visualization of a perfect idea that then becomes a magnet that attracts the creative energies of the Holy Spirit to his being to fulfill the pattern held in mind. The temple of Archangel Raphael and Mother Mary is in the etheric realm over Fátima, Portugal. Mother Mary also serves with Jesus in the Resurrection Temple over the Holy Land. Mary blue, the color that we associate with Mother Mary’s love, is almost an aqua—blue tinged with a bit of green—and through it her devotion to healing radiates to all who call to her for assistance. Her fragrance and flame-flower is the lily of the valley, and her keynote is the “Ave Maria” by Schubert. ↑ Mother Mary, “To Prick the Conscience of the Nations,” Pearls of Wisdom, vol. 27, no. 48, September 30, 1984. ↑ Mother Mary, February 24, 1980. ↑ Mother Mary, “The Continuity of Being,” Pearls of Wisdom, vol. 27, no. 63, December 30, 1984. ↑ Francis Johnston, Fatima: The Great Sign (Washington, N.J.: AMI Press, 1980), p. 139. ↑ Mark L. Prophet and Elizabeth Clare Prophet, My Soul Doth Magnify the Lord! (1986), pp. 261, 263. ↑ Mother Mary, “Behold the Handmaid [Shakti] of the Lord!” December 31, 1977. ↑ “But whoso shall offend one of these little ones which believe in me, it were better for him that a millstone were hanged about his neck, and that he were drowned in the depth of the sea” (Matt. 18:6). ↑ Mother Mary, “The Right Arm of the Mother,” January 28, 1979. This page was last modified on 21 January 2019, at 04:58.